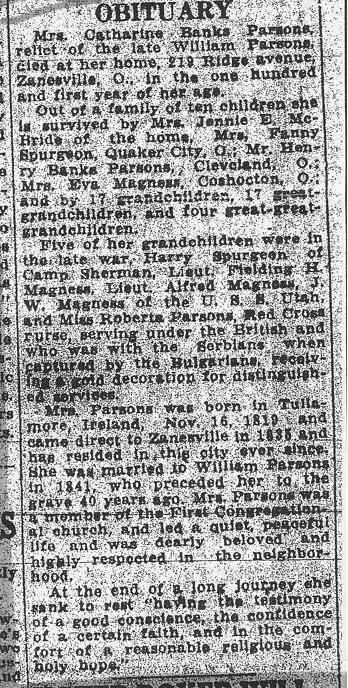 Catharine Banks, daughter of Henry Banks and Catharine Conner, was born in Tullamore, Ireland and immigrated to Zanesville, Ohio in 1835. In 1841, she married William Parsons (in Zanesville), son of Robert Parsons and Hannah Banks Parsons. His father died in Ireland and he, his brother Charles, his sister Hannah and his mother, Hannah Parsons immigrated to Zanesville in 1841. Another sister Maria, had married John Banks in Ireland and they immigrated to Zanesville in about 1838.